Shadow Magic by Kitty Wells. A Pocket Cats Book. Review: Ever thought of running off and dropping out of school? Ever imagined not having any friends to help you with homework? What about your cousin planning on dropping out of school because she and her parents move around the country so much, making it almost impossible for her to make friends? Maddy has small ceramic cats, and one big secret. 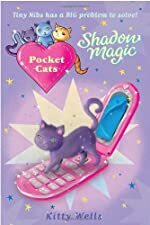 Her ceramic cats can come to life as long there's a troublesome problem needs solving, and in Shadow Magic, by Kitty Wells, there is definitely a magical mess that Maddy and Nibs have to solve, in the second book in the Pocket Cats series. In an earlier book in this series, Greykins, a nice, wise kitty who is about one inch tall, came to life. This time, it's Nibs's turn, and she hasn't been acting so friendly towards Maddy, if friendly at all. Maddy soon discovers that her cousin is planning on dropping out of school and running away. However, Maddy has no idea why. Is it because of something Maddy did or said? Has she offended her? There is only one way to find out, and that is... to spy! But will Maddy and Nibs be able to unite? Will they be too late to help Maddy's cousin? Will Maddy never see her cousin again? What would you do? Read Shadow Magic to ride the roller coaster of emotions, just the way I did as I read Shadow Magic. Shadow Magic- what an intriguing title. I find it intriguing just because the word "shadow" sounds really cool. Plus, cats are such wonderful creatures, so I decided to give this book a try. To my great delight, it's an awesome book. It's very easy to understand, and you could easily understand the plot, even if you're starting with the second or third book in the series, Pocket Cats. Yes, this is the second book. I rate this book 5 stars because it helps kids to understand the values of friendship, as well as how necessary it is. Overall, this is a great book and should be recommended for kids ages 8-10 and up, for it's a very easy read and would increase their reading skills as they enjoy the thrills that Shadow Magic presents for all ages. We would like to thank Random House for providing a copy of Shadow Magic for this review. Have you read Shadow Magic? How would you rate it?